These images look pretty great considering they're 100 years old. They look even better when you learn they've been sealed in Antarctic ice for 100 years. Discovered by a team of Antarctic conservators, the treasure trove contained 22 unprocessed cellulose nitrate negatives. They're believed to have been snapped by the Ross Sea Party way back in 1915, while they attempted to set up supply depots on the New Zealand side of Antarctica. The newly discovered negatives were processed and restored in Wellington, New Zealand. 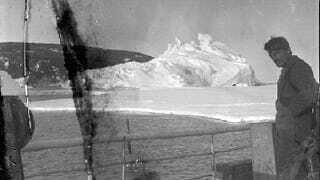 Although many of the resulting images are damaged, the Antarctic Heritage Trust has been able to recognise some of the landmarks, in particular around McMurdo Sound.